CEBU CITY, Philippines — With the endorsements of both President Rodrigo Duterte and the presidential daughter’s Hugpong ng Pagbabago (HNP), local candidates believed that their chances in the May 13 midterm elections have “favorably” grown. Vice Mayor Edgardo Labella, who heads the local Partido Barug in Cebu City, said that Davao City Mayor Sara “Inday Sara” Duterte-Carpio’s endorsement during the HNP campaign caravan in Cebu for its senatorial slate on Thursday, March 21, has been a major boost to their team’s candidacy. “It will greatly help considering that no less than both the father (President Duterte) and the daughter expressed their support to us. To a favorable extent, it will help,” Labella said. Labella added that they remain committed to the slogan of the President and HNP, which is change. Labella is running for mayor in Cebu City under the Partido Demokratiko Pilipino-Lakas ng Bayan (PDP-Laban), the President’s party. Last February 24, President Duterte raised the hands of Labella and his slate during the campaign rally of PDP-Laban in Plaza Independencia. On Thursday, HNP held a twin campaign Caravan in Cebu to woo Cebuano voters, estimated to be around 3 million. 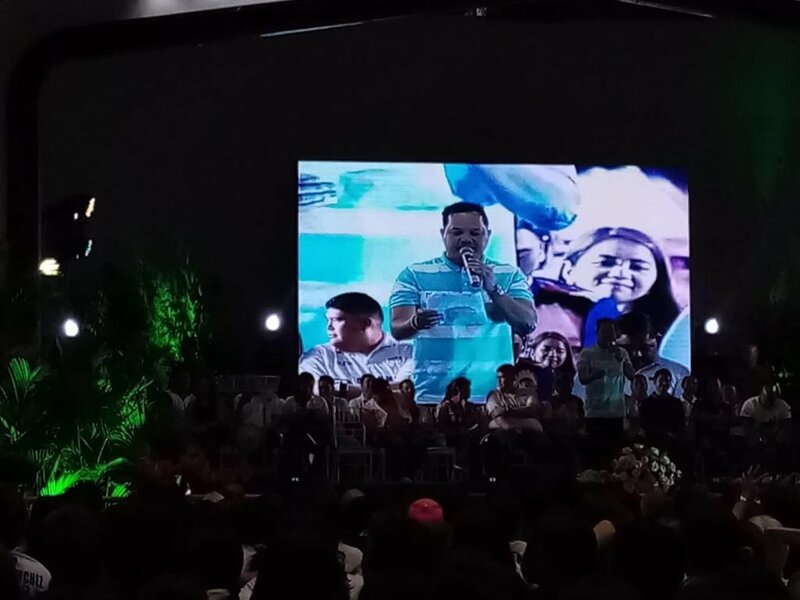 They kicked off the sortie at the Mandate City Cultural and Sports Complex along with their local ally Hugpong Mandauehanon sa Pagbabago (HMP) headed by Mandaue City Mayor Gabriel Luis “Luigi” Quisumbing, who is seeking reelection in May. Although not part of PDP-Laban, Quisumbing has earlier said that they are also committed to supporting President Duterte, especially in his campaign against corruption and illegal drugs. “Whether our hands were raised or not (by President Duterte or Mayor Sara), what’s important is that (the candidate is) genuine in helping the fight against corruption and drugs. As long as (the candidates being endorsed) genuinely push for anti-corruption and anti-drugs (campaigns), so be it. Many hands make work light,” Quisumbing said when asked about the endorsement of his opponent’s slate by the President. The candidates then moved to the International Eucharistic Congress (IEC) Convention Center in Barangay Mabolo in Cebu City in the afternoon where they were hosted by Labella’s Partido Barug. Duterte-Carpio attended the twin sorties and endorsed the 13 senatorial aspirants that are backed by HNP, as well as the local candidates of HNP and Partido Barug. Senatorial candidates former police general Ronald “Bato” dela Rosa, former presidential adviser Francis Tolentino, former broadcast Jiggy Manicad; Ilocos Norte Governor Imee Marcos, former senator Jinggoy Estrada and Tootsy Angara, who represented her husband Senator Sonny Angara, attended the sortie in Mandaue City. In the afternoon, Taguig City Representative Pia Cayetano, Maguindanao Representative Zajid Mangudadatu, Senator Koko Pimentel and former senator Bong Revilla joined the campaign activity at the IEC Convention Center. The twin campaign rallies were received with cheers and applause from the crowd who was entertained by comedian Bayani Agbayani and Filipino rap icon Andrew E.